shone in New York, winning the RAW World Chess Challenge, another great Scandinavian chess player quietly left the chess world. Bent Larsen, the legendary Danish grandmaster and world championship candidate, died on September 9 in Buenos Aires at the age of 75. An optimist by nature, Larsen was one of the most fierce fighters of the last century and one of the few players capable of challenging the Soviets for the world championship title. He came close, participating in seven Candidates matches. But when his chances were the best, he was stopped twice by players who became world champions: by Boris Spassky in 1968 and by Bobby Fischer in 1971. Still, throughout his career, Larsen was considered to be one of the best tournament players in the world. Among his many triumphs were first places at the Interzonal tournaments in Amsterdam in 1964, in Sousse in 1967 and in Biel in 1976. I was fortunate to witness Larsen's many victorious drives in tournaments and matches. He was the ultimate chess battler, always interested in wins and first places. Sometimes he reached too far, but it never stopped him from reaching again. He played with enormous energy and great fighting spirit. Offering him a draw was a waste of time. He would decline it politely, but firmly. "No, thank you," he would say and the fight would go on and on and on. Larsen strived in both simple and rich positions, did not shy of complications and it was an honor to play against him. He had deep knowledge of the game and was always ready to go where nobody else dared to tread. He created several original opening ideas, often shocking his opponents with risky and unusual moves in the middle game and scoring many points by grinding down players in long endgames. From 1963 till 1986, we played 30 games against each other all over the world. It was always a pleasure to meet him at the bridge or chess table. We laughed together, drank together and I loved to listen to his countless stories. Bent was also an outstanding, witty chess writer. He will be missed. 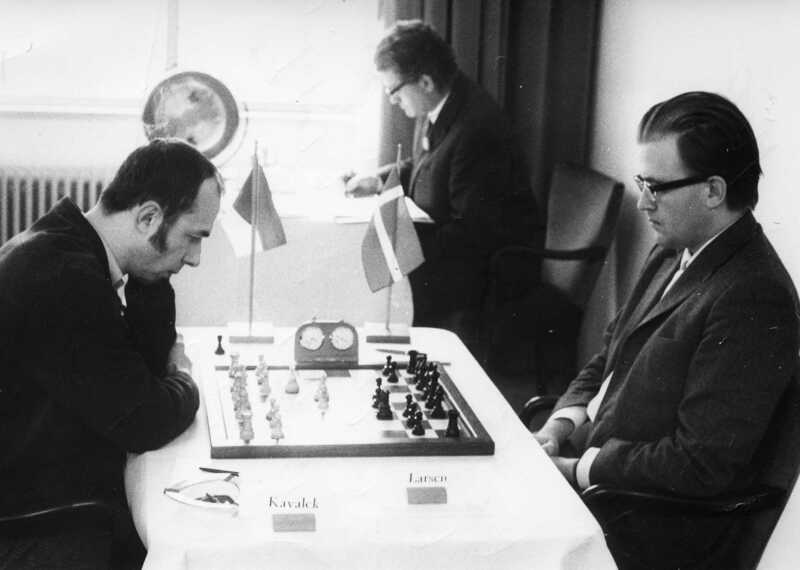 In a double-round tournament in 1970 in Lugano, Switzerland, Larsen destroyed me in both games and on the back of the picture from our first game he wrote: "With best wishes to Lubos, who allowed me twice to believe in chess beauty." Larsen considered our second game in Lugano as one of his best. In his book Studies for Practical Players, published by Russell Enterprises, the outstanding Russian chess composer Oleg Pervakov introduced the idea performed by Larsen with these words: "During play, situations occur fairly frequently where one side finds its intentions blocked by one of its own pieces or pawns, either occupying a vital square, blocking a line, or introducing some other annoying element into the position. And not infrequently, the speculative removal of such personages from the board alters the assessment of the position completely. Noting this kind of nuance and accurately executing such a liquidation is a sign of the highest kind of mastery." Analyzing the stunning hidden possibilities was as exciting as playing the moves over the board. (I thought here for 16 minutes about the sacrifice 19...Bxc4! and left myself with only 12 minutes for 21 moves. It is remarkable, since the time control in those days was 40 moves in 2 ½ hours. What was I doing for the first 19 moves?) 19...Bf7?! (Chickening out, although my instinct told me that the bishop sacrifice is the right thing to do. Larsen did not think much of it, saying that after 19...Bxc4! 20.bxc4 Nxc4 21.Qe2 black does not have anything. 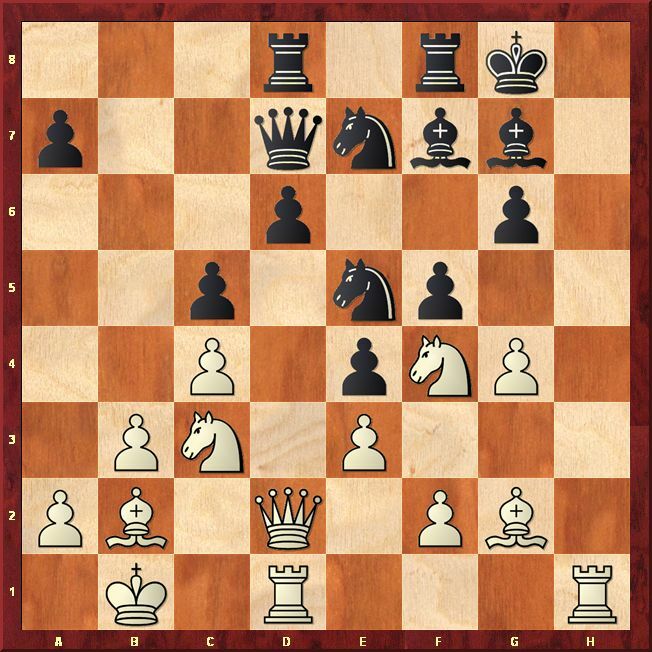 However, Gavril Veresov, a Belorussian master, later provided splendid analysis, confirming that black's attack was indeed very powerful after 21...Nxb2 22.Kxb2 Qa4! and suddenly a disaster is looming on the long diagonal a1-h8 after 23.Qd2 [On 23.Qc2? 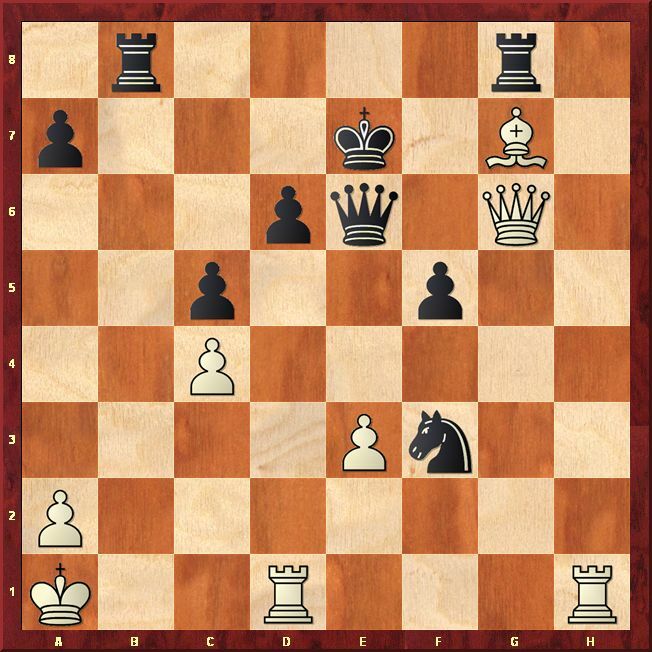 Rb8+ 24.Kc1 Qa3+ 25.Kd2 Rb2 wins for black.] 23...Rb8+ 24.Ka1 Qa3! 25.Rc1 d5! !, and white has a hard time coping with black's threat to push his d-pawn. For example, after 26.Nfxd5?! Nxd5 27.Qxd5+ Rf7 28.Qd2 Rd7! 29.Qc2 Rd3 white loses quickly. Black has to be more creative after 26.Ne6 with 26...Bf6!! 27.Nxf8 Kxf8 with powerful threats, e.g. 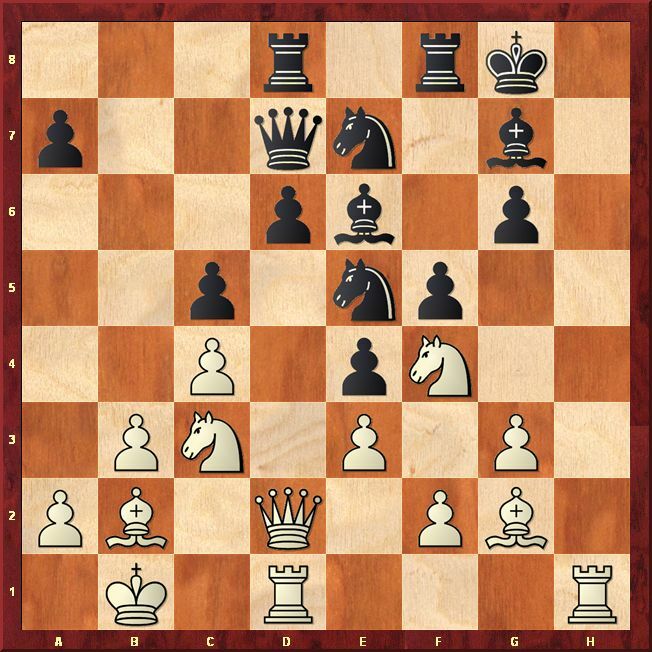 28.Qc2 c4 29.Qd2 Rb3 winning; or 28.Rc2 Rb3 29.Rhc1 Nc6 and the threat 30...Nb4 decides, since after 30.Qxd5 Bxc3+ 31.Rxc3 Qb2 mates. After 26.Bf1 black has two ways to victory. The most amazing variations come after 26...Rb4! 27.Nfxd5 [The other knight leap 27.Ne6 is met by 27...Rfb8 28.Nxg7 Rb2 29.Rc2 Qxa2+! 30.Nxa2 Rb1 mate. 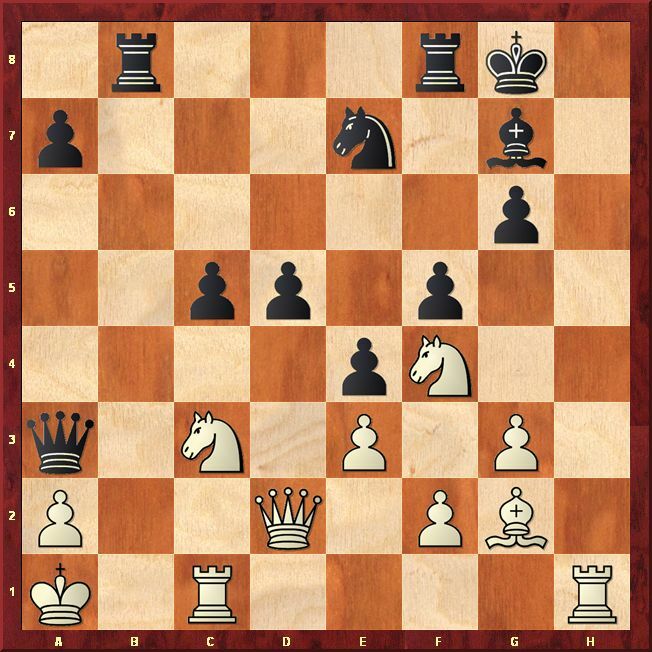 ], but here Veresov suggested 27...Qxc1+ 28.Qxc1 Nxd5, which is unclear after 29.a3. He missed the incredible 27...Rd8! !, for example 28.Nxe7+ Kf7 29.Ned5 [On 29.Qc2 Bxc3+ 30.Qxc3 Qxc3+ 31.Rxc3 Rd1+ 32.Rc1 Rxc1 mates.] 29...Kf8!! 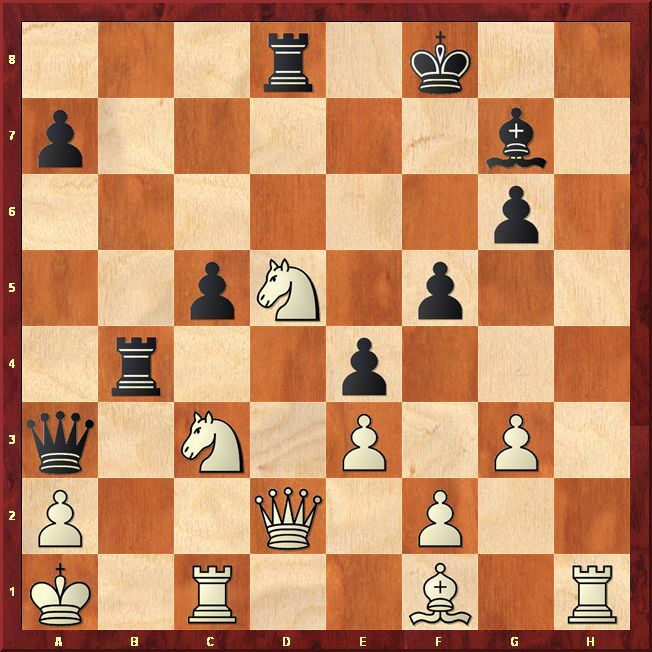 and amazingly, white does not have a good defense to 30...Rxd5!, for example 30.Be2 Rxd5! 31.Qc2 Rd3! 32.Bxd3 exd3 33.Qd2 Rb3 and there is no defense to 34...Rxc3 winning. 32.Bf8+!! Rbxf8 33.Rh7+ (After 33...Rf7 34.Rxf7+ Qxf7 35.Qxd6+ Ke8 36.Qd8 mates.) Black resigned.